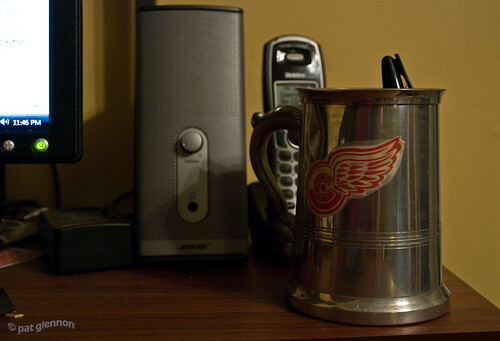 “R” Is For Red Wings Mug (60/365 v2.0) – Annoyingly Boring? First off, yesterday’s post was indeed an April Fool’s hoax. Thanks to my sister for blowing the whistle on my in the FIRST COMMENT. NO FUN! Now, on to today – in a post that will make you hope I wasn’t fooling yesterday, I present my homemade Detroit Red Wings mug. The mug isn’t home made, but about 15 years ago I cut a Red Wings logo out of a magazine and attached it to this pewter mug with Scotch tape. The mug serves as a pen/misc junk and stuff holder now. 15 years? That’s remarkable longevity for Scotch tape.